We live in exciting times. Our solar system is moving into a ‘new place, in space’, our planet and our race is naturally emerging from the depths of unconsciousness that has plagued us since the metaphoric fall from Eden. How does this impact YOU? Do you feel as if there is “something” you are meant to do? Do you feel “connected” to people or places and not know why? Do you rely on your “gut feelings”? Do you worry about what will happen to your consciousness when you die? How can we find the answers? 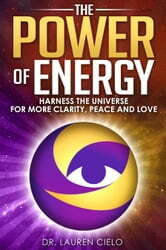 Dr. Lauren Cielo, creator of Golden Rose Psychic Services, a global virtual community dedicated to spiritual healing and training, harnesses the power of professional knowledge and first-hand experience received from 1000s of clairvoyant readings to create this breakthrough guide on how to peel away the veil of ignorance that overshadows our consciousness each time our divine soul incarnates in a life form. As our planet’s highest life form, homo sapiens, are transformed by the vibrant new energies that oscillate in and around Mother Earth. Parts of our brains are activated with new information shining light into previously dark spaces. We are evolving and our world is changing. These same new energies that gave rise to humankind’s explosive advancements in the scientific and technological knowledge located in the left hemisphere of our brains, are also altering our “right brains”. These energies enhance our ability to detect and utilize the subtler hints of intuition, clairvoyance and clairaudience. We are now smarter and more psychic than ever! As the old Earth reality becomes more malleable, the gap between our intellect and intuition becomes easily bridged. As a former engineer turned clairvoyant healer and teacher, Dr. Cielo explains how interdimensional guides can now access our plane of reality as it shifts and increases in vibration. These quantum beings are introduced and described in detail as they have played a pivotal role in the creation of this work, helping Dr. Cielo understand the old riddles that have plagued our philosophies and our consciousness since the being of our time. • What is Planet Earth and why do we come here? • Where do we go when we die? Dr. Cielo provides guidance into how to re-shape your reality by revising the blueprints we create for our lives. By understanding soul’s purpose and the experiences our soul desires, we come out of resistance, fear and victimhood which slow down the natural shift of our world and make this evolutionary leap more frightful and painful. Discovering how to harness the new vibration and the power of energy will bring more clarity, peace and love into your life. You won’t be the same after learning these powerful truths; the truths each of us now has the ability to tap into through our developing intellectual and intuitive DNA.